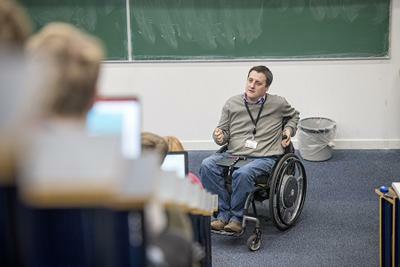 Southampton Business School's Principal Teaching Fellow in Accounting, Richard Cartwright, was announced as one of the most influential people with a disability in the UK at a reception at the South Bank Centre on Wednesday 17 October. The Shaw Trust Disability Power 100 List is an annual publication of the 100 most influential disabled people in the UK. More than 700 nominations were received for the 100 places. The Disability Power 100 List is compiled by an independent judging panel, chaired by Kate Nash OBE. Kate is the world's leading authority in 'Networkology' - the science behind the growth of workplace networks and resource groups. In 2007, she was awarded an OBE for services to disabled people. In 2013, she was appointed Ambassador to Disability Rights UK. Richard Cartwright is an award-winning lecturer at Southampton Business School and a Chartered Accountant who serves as a Council Member for the Institute of Chartered Accounting in England and Wales (ICAEW). Richard started his early career at professional services firm KPMG. Two weeks into his graduate training career, he broke his neck in an accident, which resulted in life-changing injuries. After nine months in hospital, he returned to work part-time before restarting his graduate training programme a year later. His big break came in 2011 when he was seconded to the company's Department of Professional Practice to run training courses. Richard said: "I loved it; for the first time I felt I could do my job as well as (or better than) my colleagues." Having found his true vocation and wanting to teach full-time, Richard left KPMG and moved into Higher Education, joined Solent University as a Senior Accounting Lecturer in 2012. Whilst there, he also helped found Team Solent Sharks Wheelchair Rugby Club. In 2015, Richard joined the University of Southampton's Business School. A passionate advocate for volunteering, Richard espouses the benefits of putting your hand up and helping out: "It has led to some weird and wonderful opportunities from helping people to play a sport, to helping shape government policy in education." Volunteering has also helped his career flourish with his extra-curricular activities being a significant contributor to his successful promotion in 2018, making him one of the youngest lecturers of his seniority in the UK. 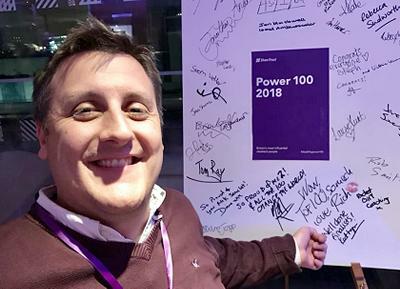 Richard said, "It's an absolute honour to have made The Shaw Trust Power List. It was a great evening meeting some truly fantastic people!" "Congratulations to Richard Cartwright. The judges were beyond impressed by the standard of nominations but selected the most influential people who are proving that disability or impairment is not a barrier to success. One of our aims for the Disability Power 100 List is to demonstrate to young people that they can achieve their ambitions. At Shaw Trust, we work with government, local authorities and employers to support people overcome barriers which hold them back from achieving their potential."